"I aim to be a health care partner for each of my patients; I want to work with women to be their advocate, their provider and their guide to quality health care and an excellent patient experience." 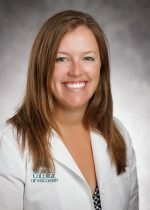 Dr. Domeyer received an undergraduate degree in English from the University of Iowa in 2008 where she also received a minor in Spanish and Certificate in Global Health Studies. She then graduated from the University of Iowa Roy J. and Lucille A. Carver College of Medicine in 2012. She completed residency at the Maine Medical Center in Portland, Maine in 2016. Dr. Domeyer enjoys practicing the full spectrum of obstetrics and gynecology ranging from care of the well woman to managing complex obstetric and gynecologic complaints. She also has clinical interests in office-based procedures as well as surgical management of gynecologic problems. She has a particular interest in care of female veterans and also provides care for women at the local Veteran’s Hospital. She has a focus in patient safety and quality care and serves as a patient quality and safety officer for the department. During her training, Dr. Domeyer was awarded the ambulatory clinic award from Maine Medical Center in 2016. She served as the chief resident for medical student education and took an active role working to improve medical student education in her residency program. Very friendly. Made me feel comfortable.